This post begins inside and ends up outside. Opposite of the last post I guess. Must mean I’m making progress. Like I said, it’s very modest. 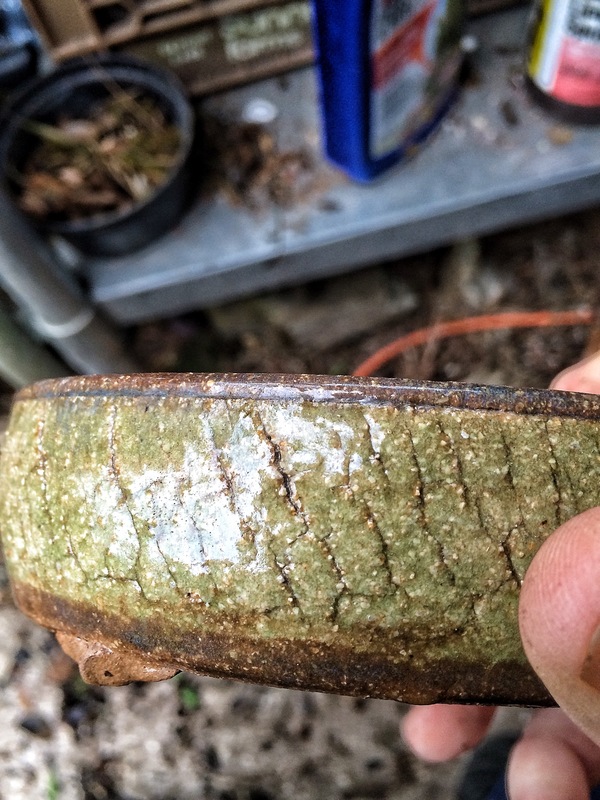 The root base is very average. And I’ve neglected it a little. You can see how much it’s grown since I wired it. 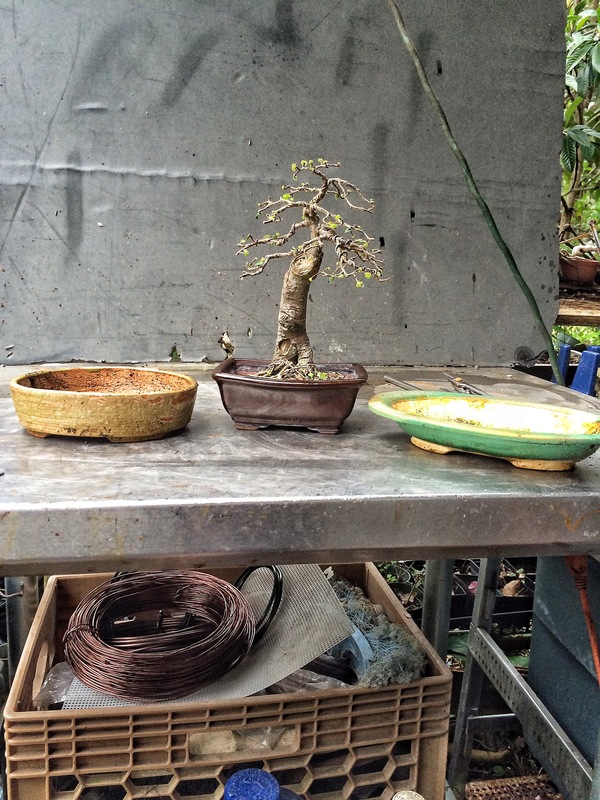 My plan today is to unwire, trim and rewire, and repot. Whoa?! 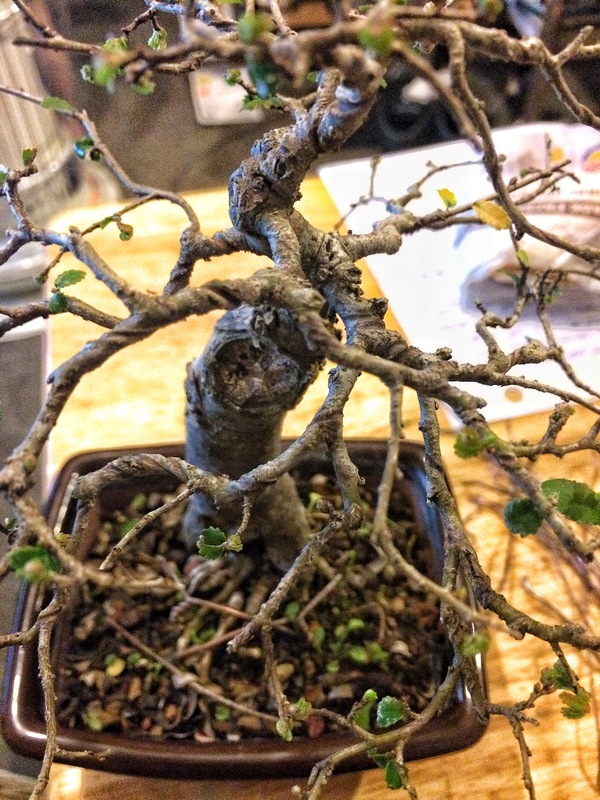 Repot? I say that because the keen eyed readers in the audience probably saw the emergent and even emerged leaves on the tree. That’s a no no, ain’t it? 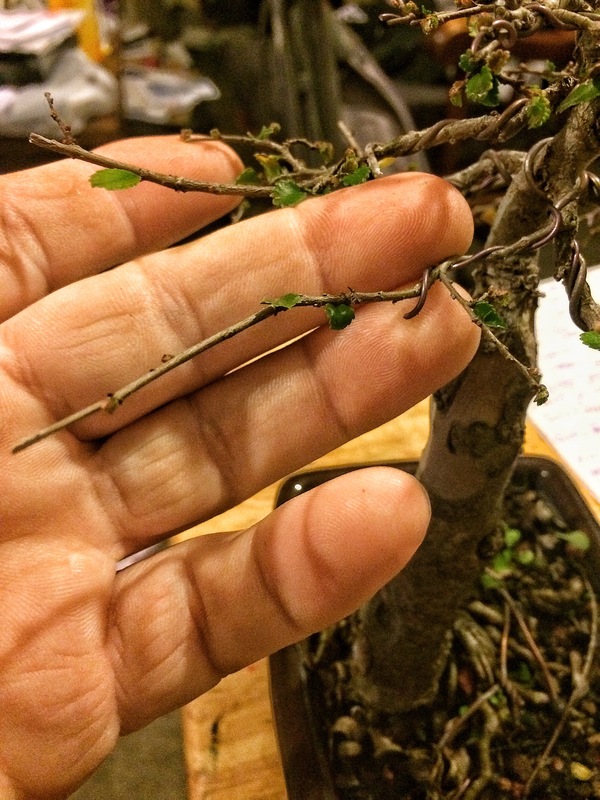 Repotting a deciduous tree with leaves on it? 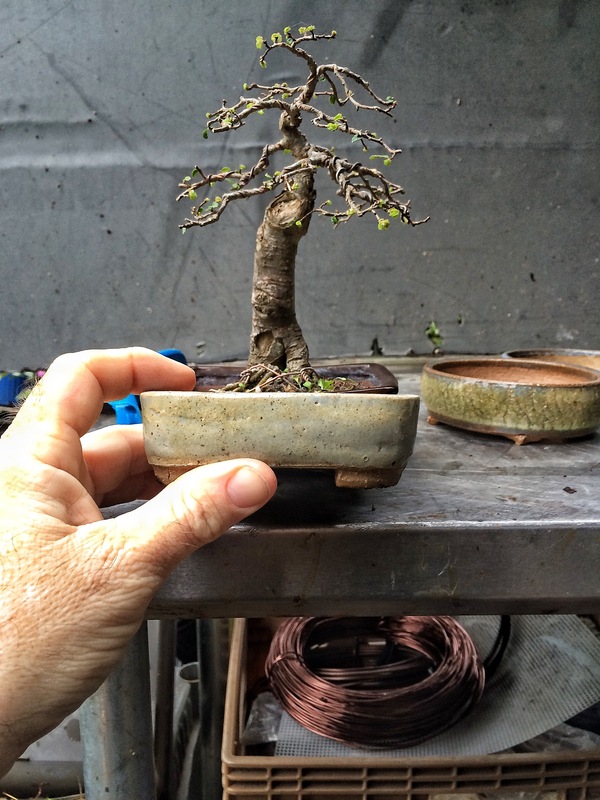 Here’s a secret you won’t see in any book: you have, with a chinese elm specifically, a much greater leeway in your repotting times, than with most other deciduous trees. 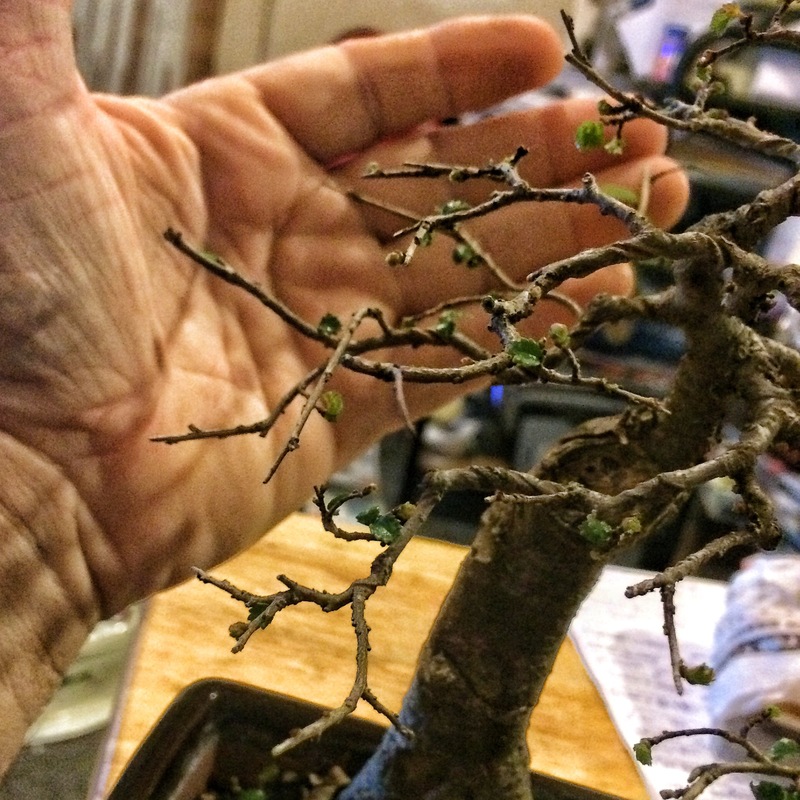 One could repot with it fully leafed out for a month even. 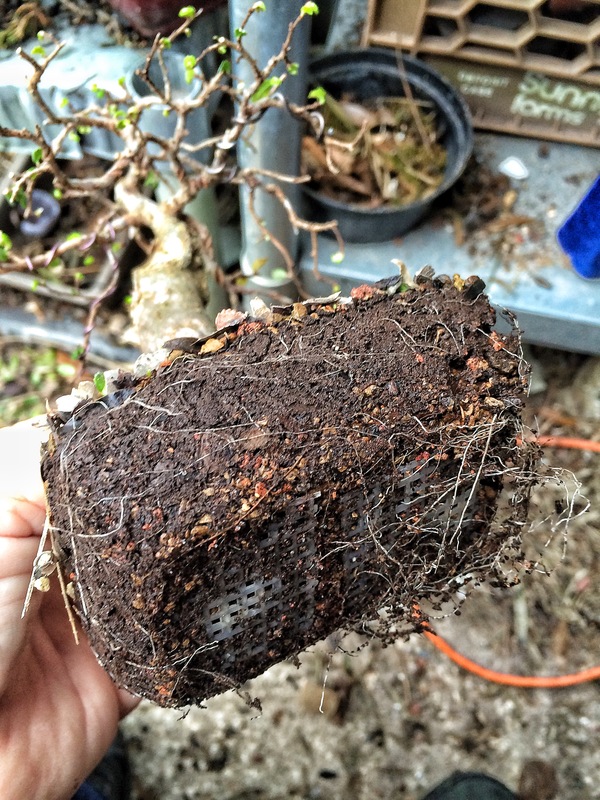 The reason is that this is a near tropical tree (why it can thrive here in Florida). In many places in Florida, or if you protect it from the cold up North, it doesn’t even drop it’s leaves. 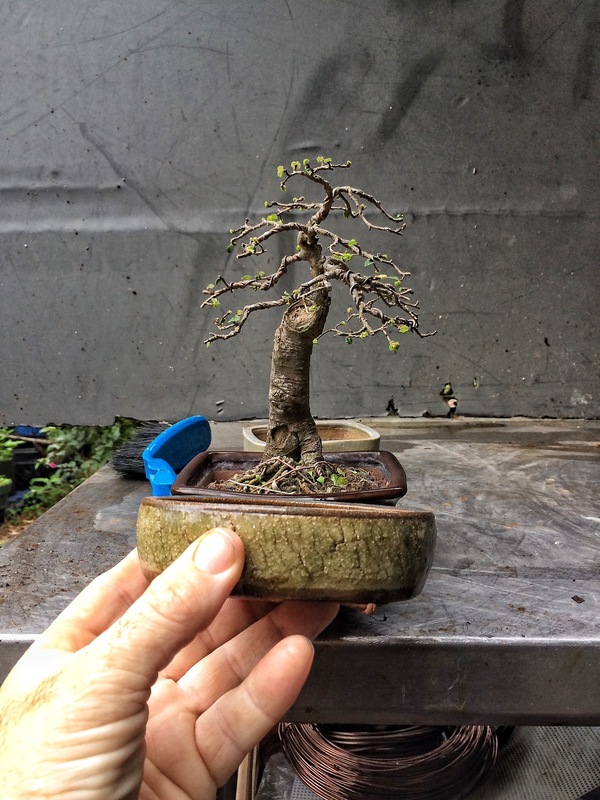 If the tree is in full leaf it’s best if you defoliate it, it will help the tree acclimate better. When a tree puts out its first leaves it puts out new roots too. 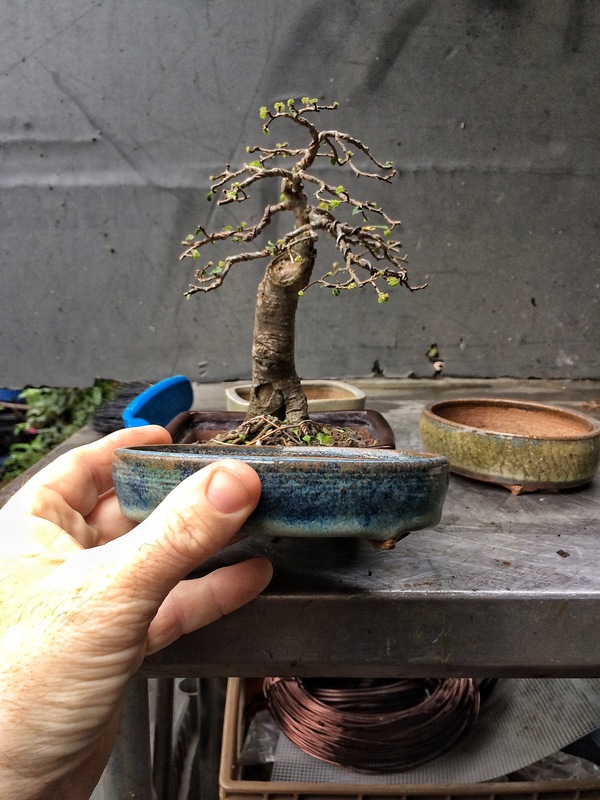 By defoliating when repotting the already leafed-out chinese elm, you will stimulate more root growth and ease it into the stress of the repot. 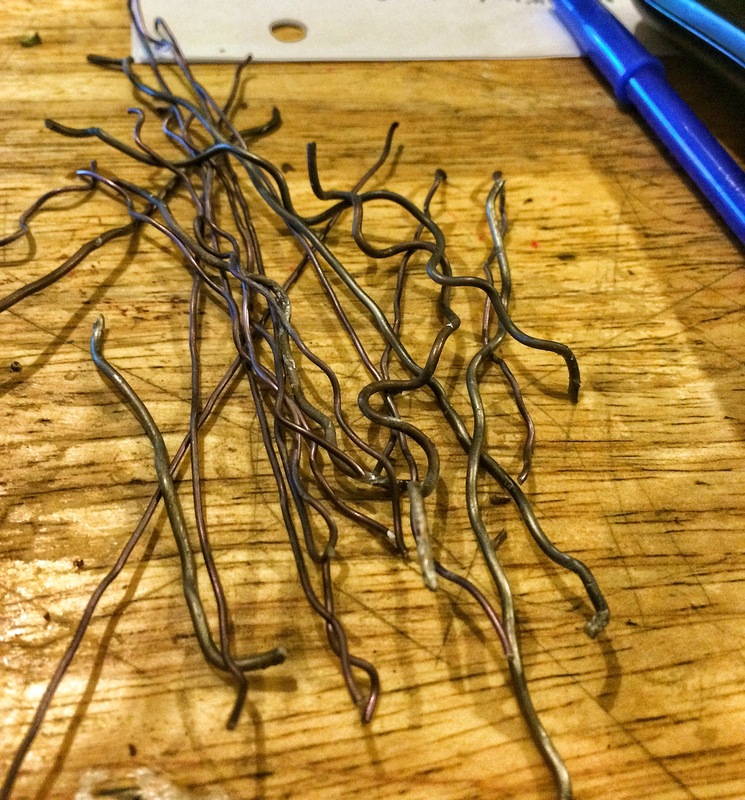 Getting back to my tree, I first remove the wire. 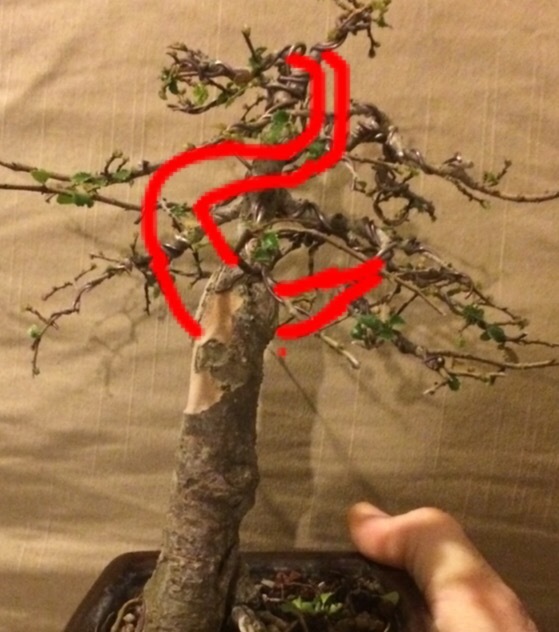 The movement of those branches is from the wiring. The ramification is from applied trimming. That lesson is in this post. 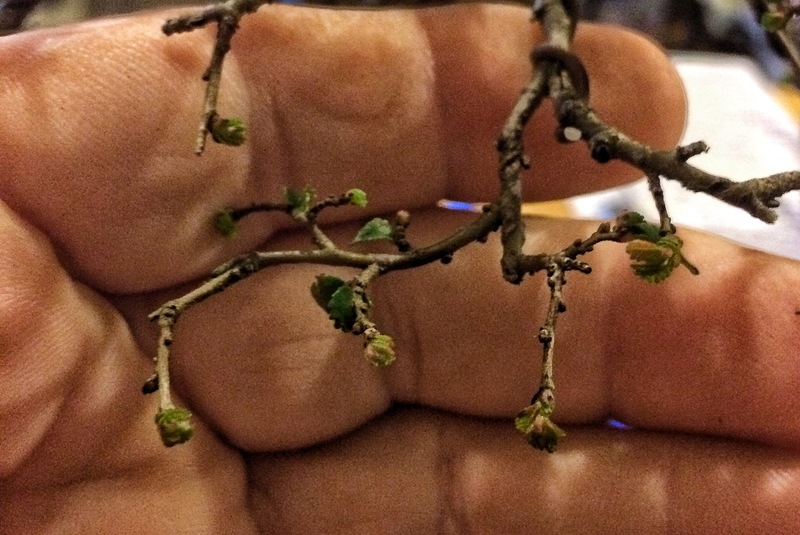 Don’t be alarmed if you have some branch dieback after winter, it’s normal. And, for those who are too lazy to click on the ramification link, here’s a quick lesson for you. 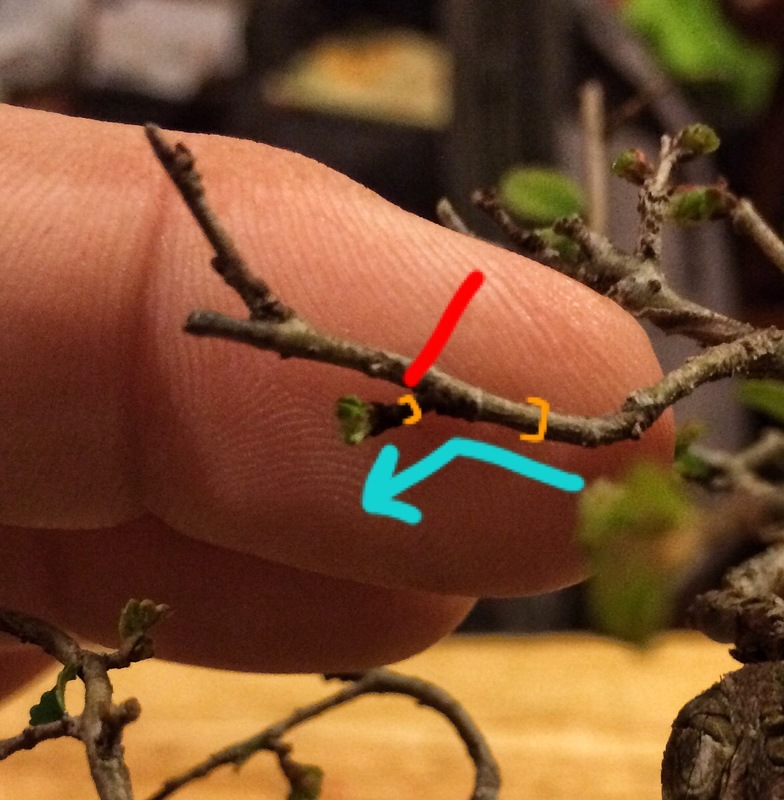 I cut at the red line for movement, which the lovely turquoise line shows, and also for taper, which the orange brackets show, the main branch is thicker than the side branch. Dramatic lighting courtesy of the TV. Now it’s time to venture outside. I need to pick a pot. I’m fond of the pot shape it’s in even though it’s not right technically. 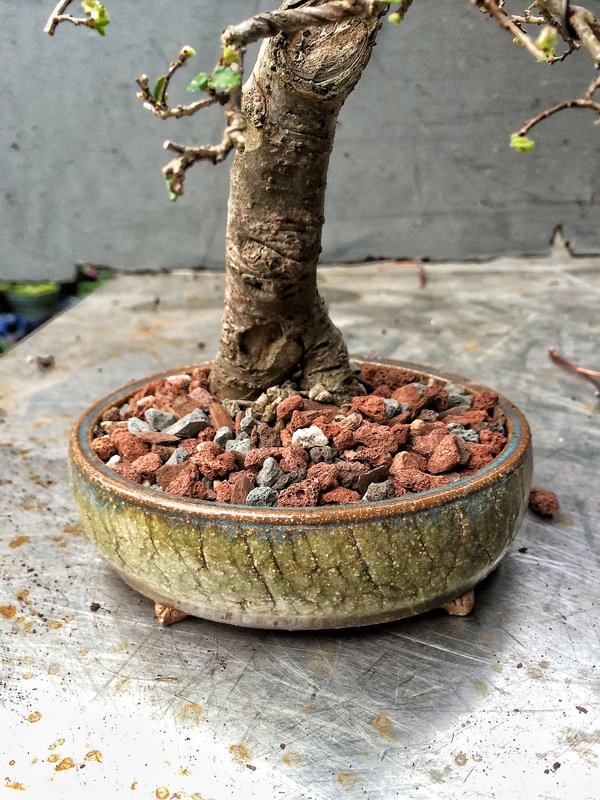 Let’s see what I can find…..
A pot I bought way back in 2009 and have been looking for the right tree since. A beautiful Taiko Earth creation. 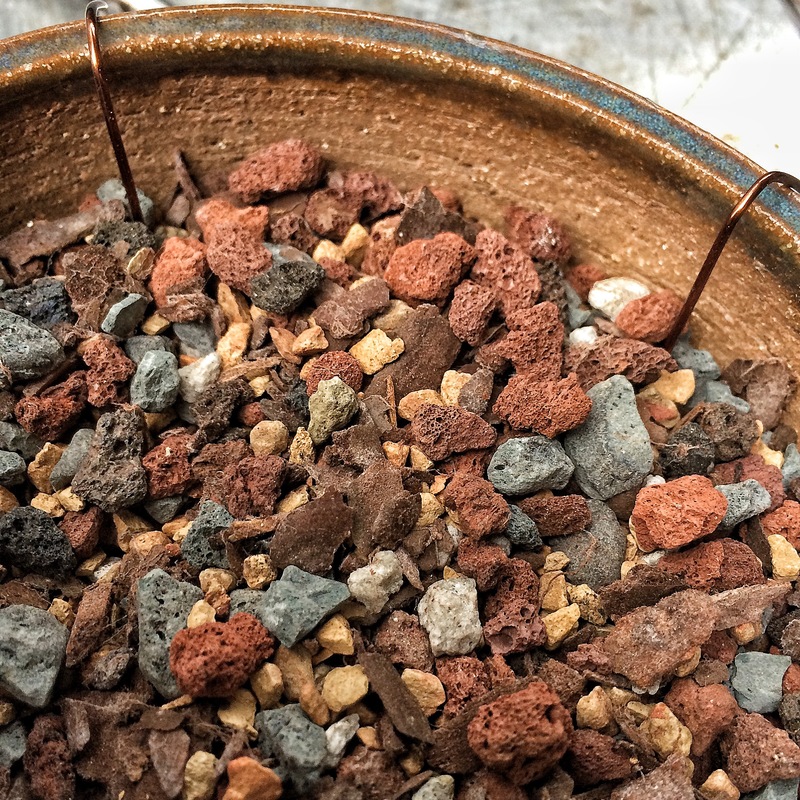 Look at that color, glaze, and texture. 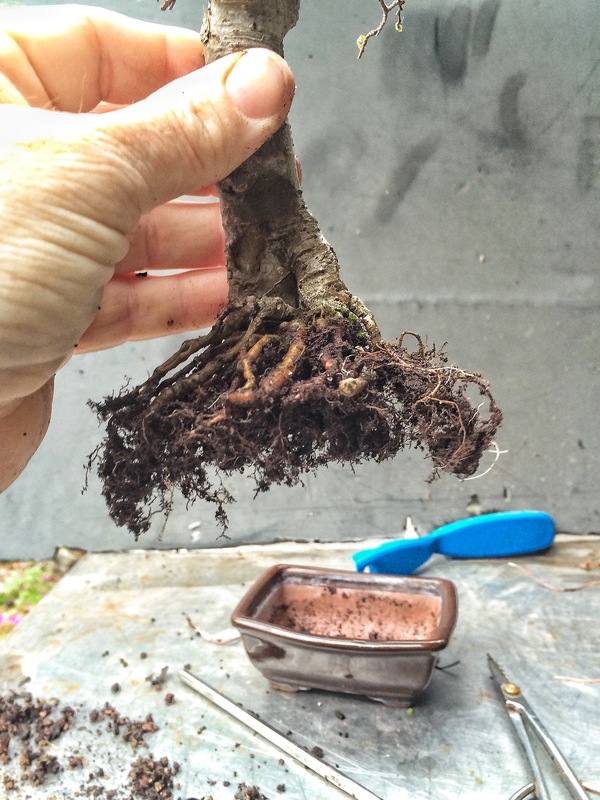 And now we can root prune. 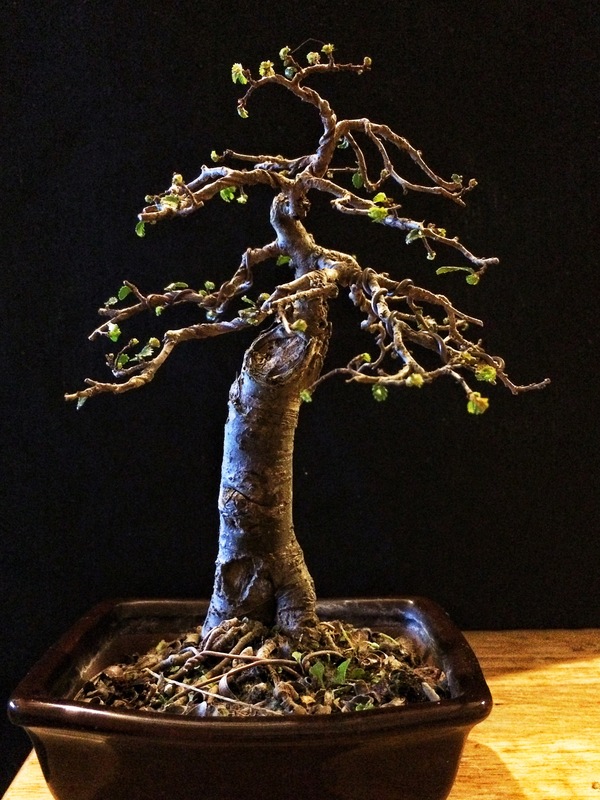 An elm doesn’t have white roots. Those are from weeds. 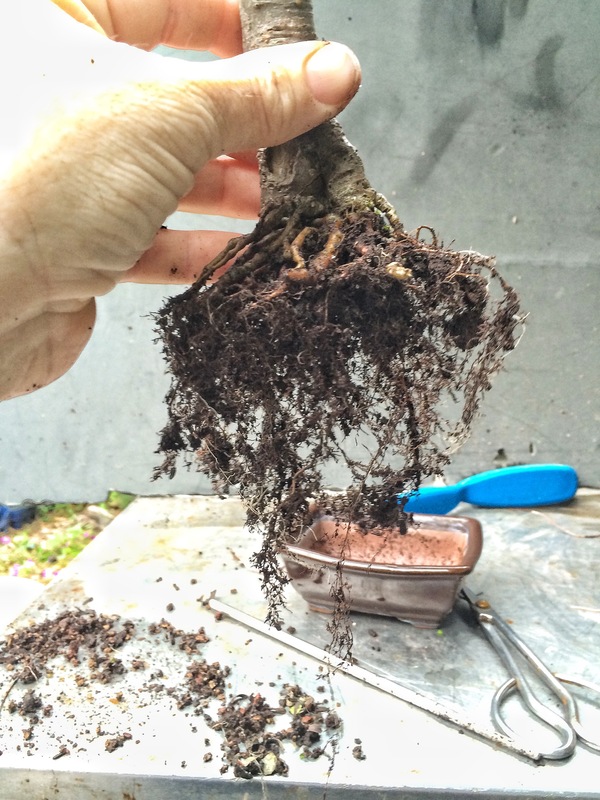 It’s the best and easiest time, when repotting, to really be thorough with your weeding. Sorry about the pasty, hairy leg. I’ve been housebound lately. So…using just a chopstick, I comb out the roots. 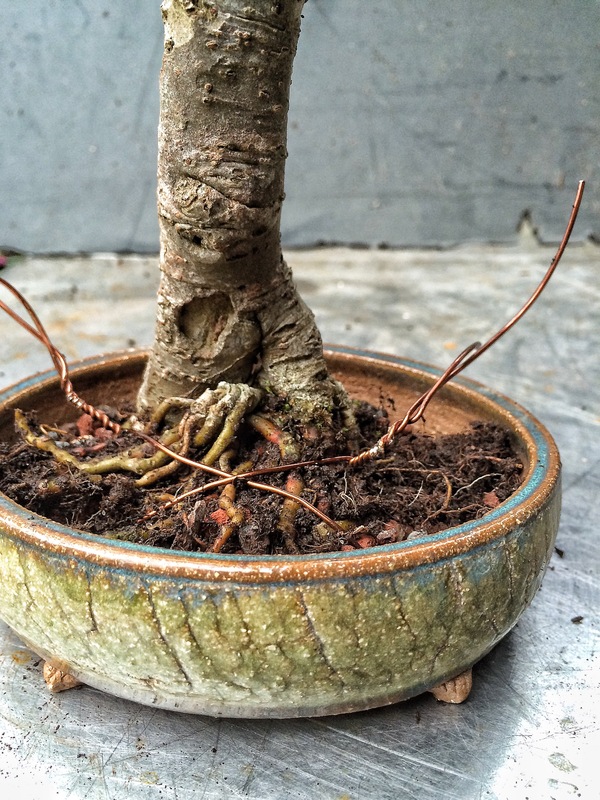 Then I gently nestle the tree into the pot, and then tie it in brutally. I say that because many people put some kind of soft covering on the tie-down wires. In all the years I’ve been doing this I’ve never had damage from tie-down wires. Even when I cinch it down. 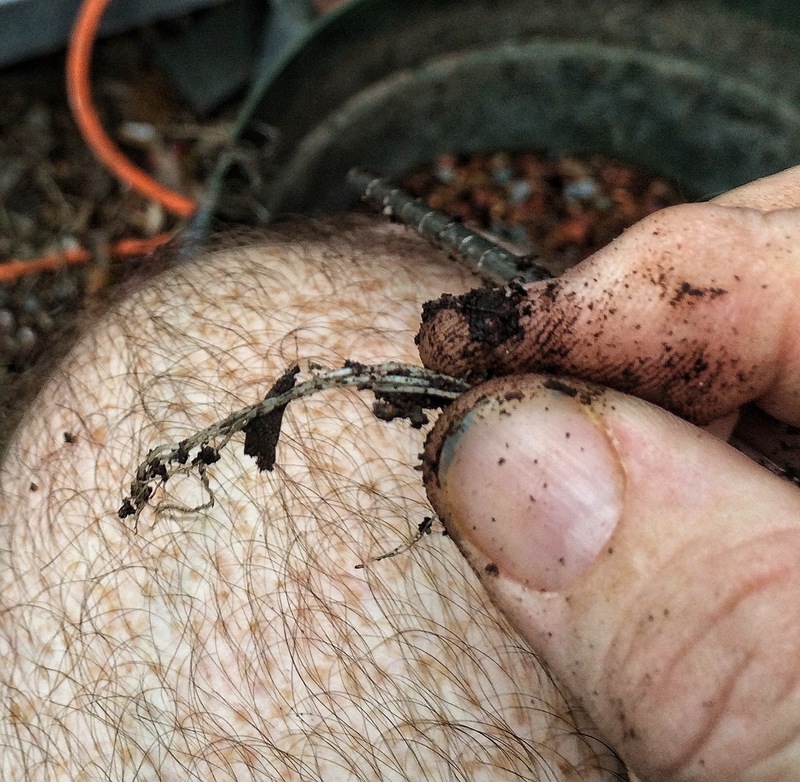 I back fill soil and chopstick it in. 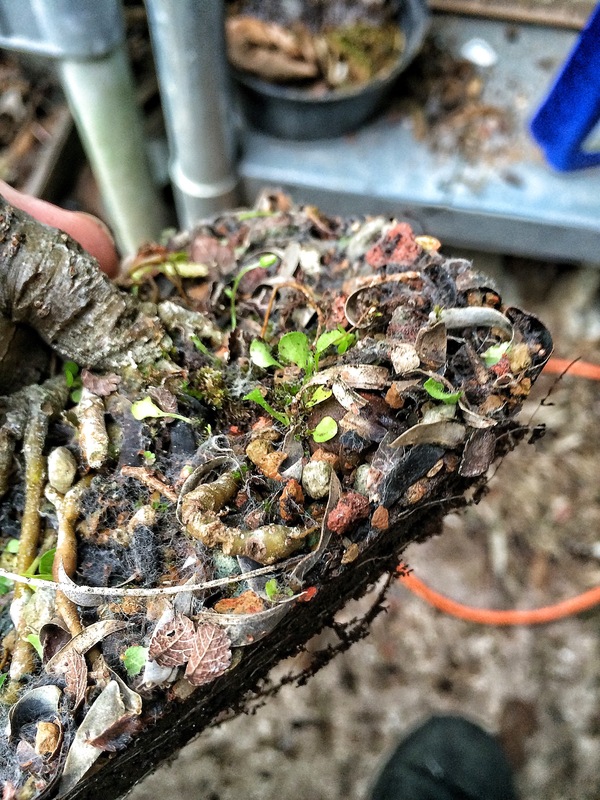 Then I put a pre-emergent weed treatment on and then a handful of…. Nope. 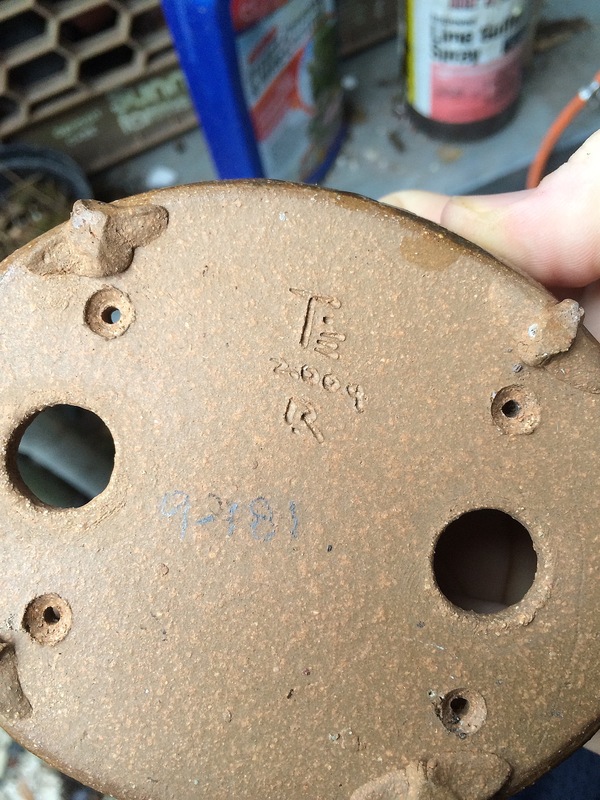 The little black granular stuff in the cup is fertilizer. 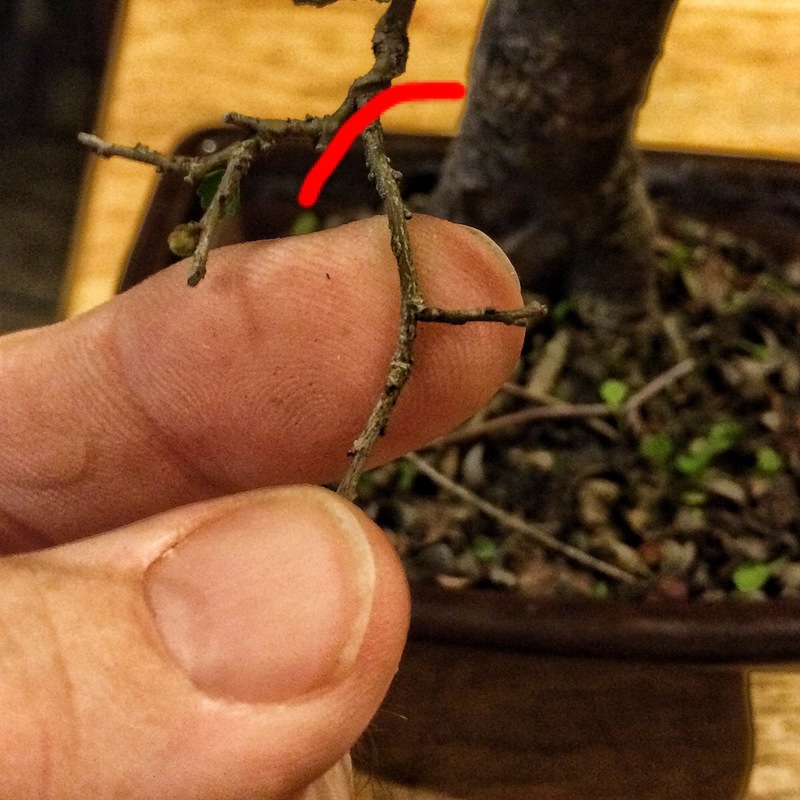 This is the last lesson of this post: when repotting a deciduous tree that is in branch development stage, fertilizer at that time will result in long internodes and giant leaves. We are controlling growth at this point. So no ferts, ya’ dig. Wait until you have three sets of leaves, trim back to one set, then fertilize for the season. 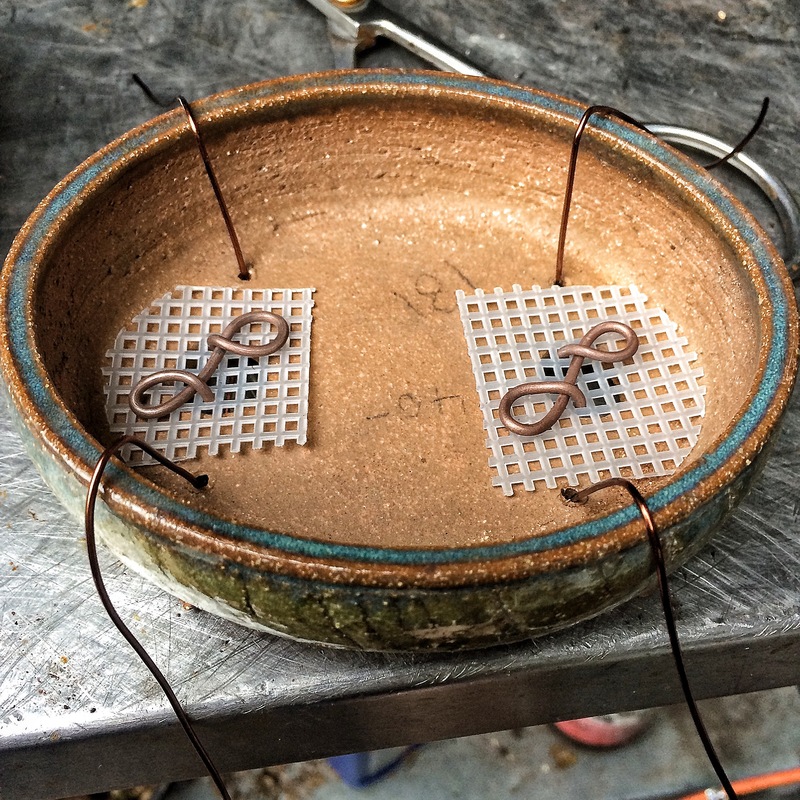 I ended up only putting two wires back on, most of the shaping was done with scissor discipline. Ready for the glamour shot? I like its new pot, it’s classy now. Ok, I lied about lessons, one last one. 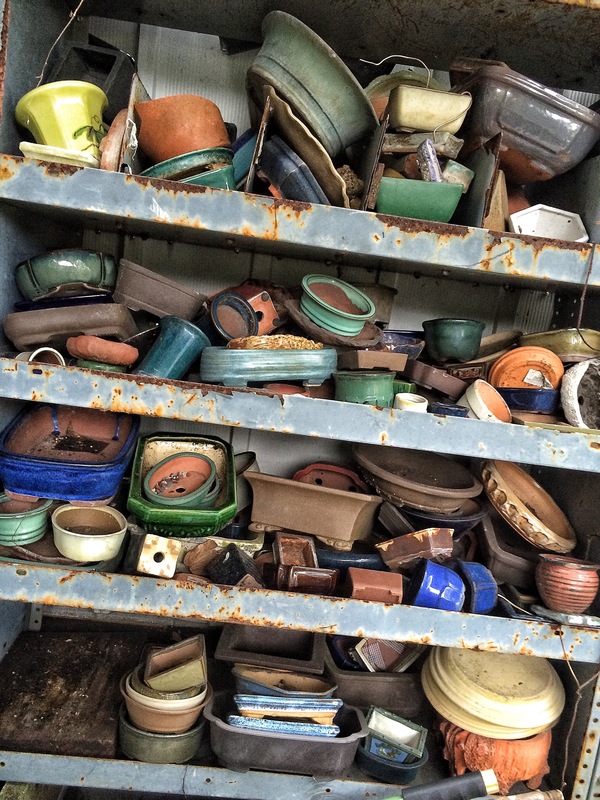 It’s better too have many pots to choose from than not the right one. 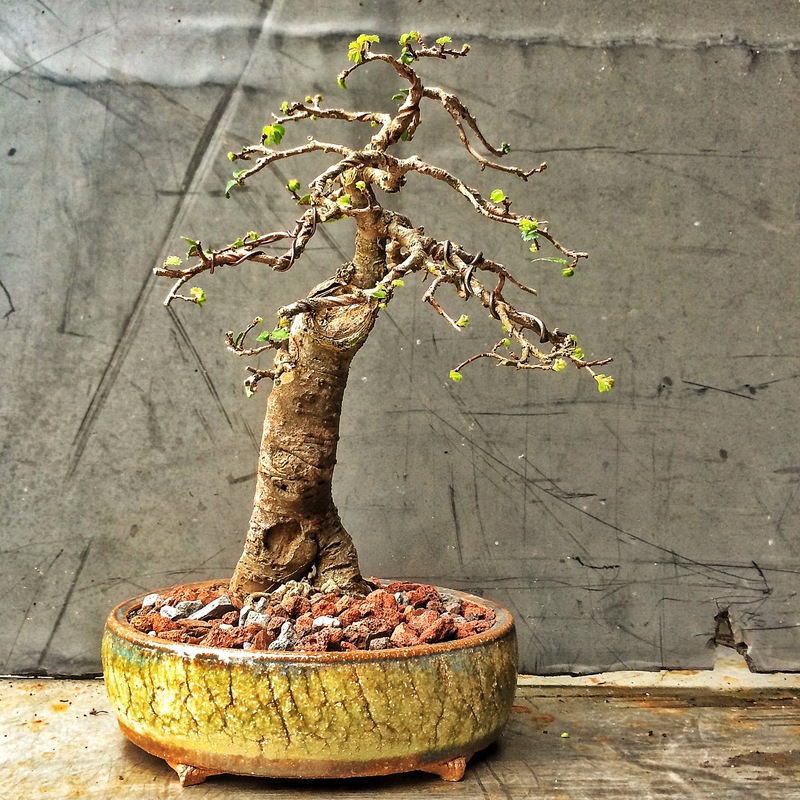 So find a good pot dealer with good stock from all over the world, good prices and good varieties. It’s repotting season, time to get busy! 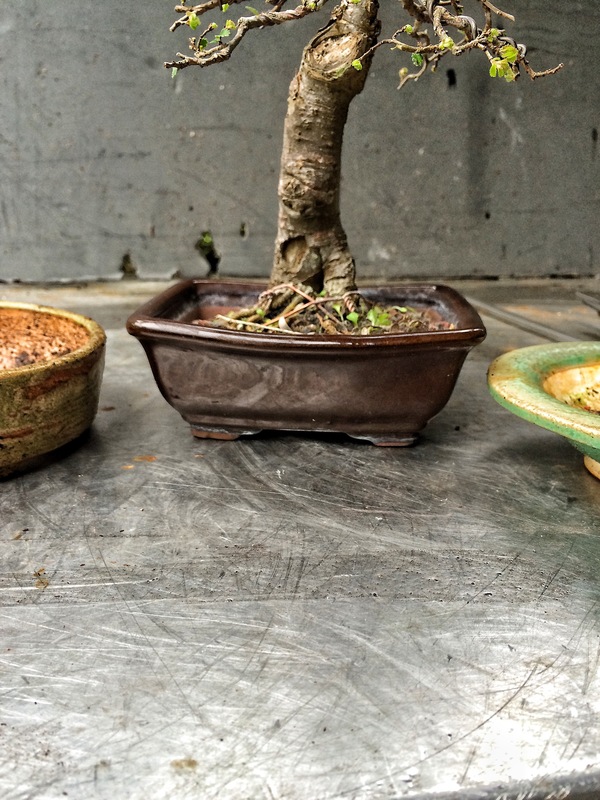 Next Bonsai’s got a new pair of shoes! 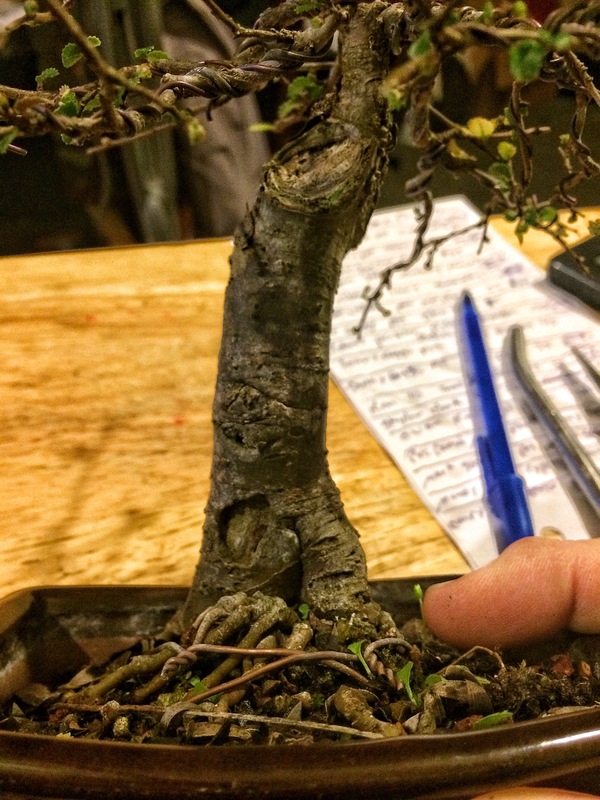 Glad to see you back at it….Great little tree. 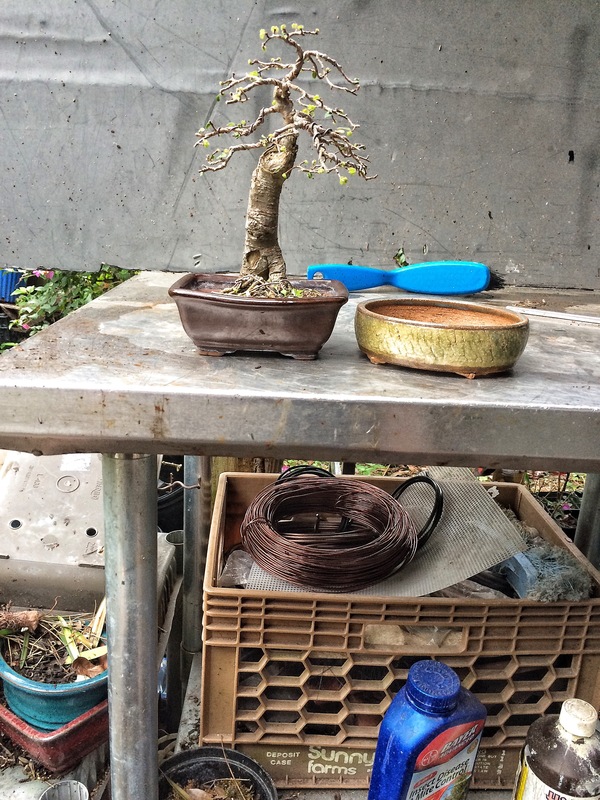 I always enjoy your bonsai blogs. Nice blog and love all the tips! 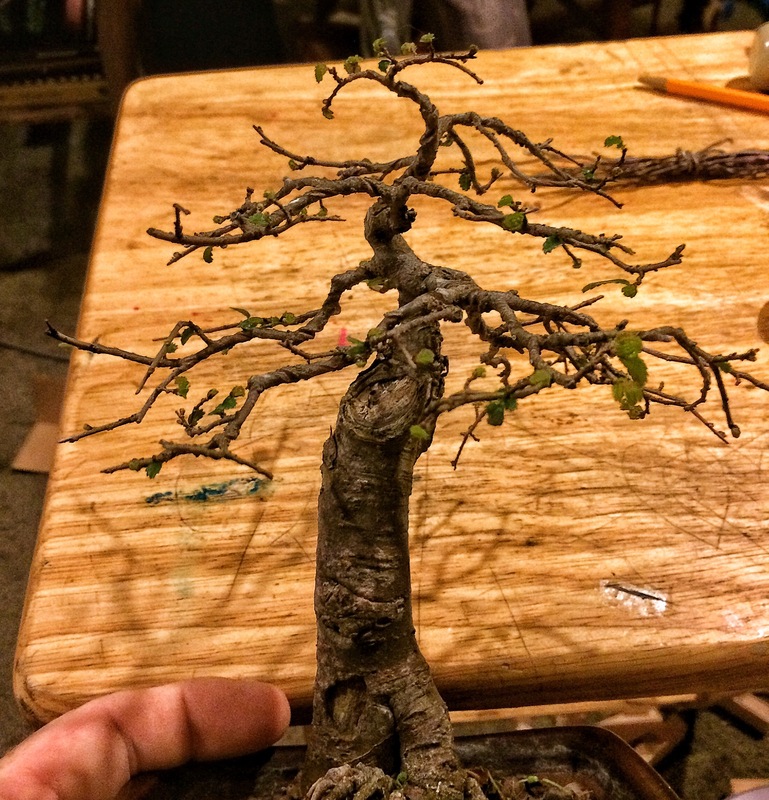 Adam does a nice job on a neglected little elm. Good to see ya kicking again. Beautiful tree goes well with the new home, and that soil mix is sure purty. 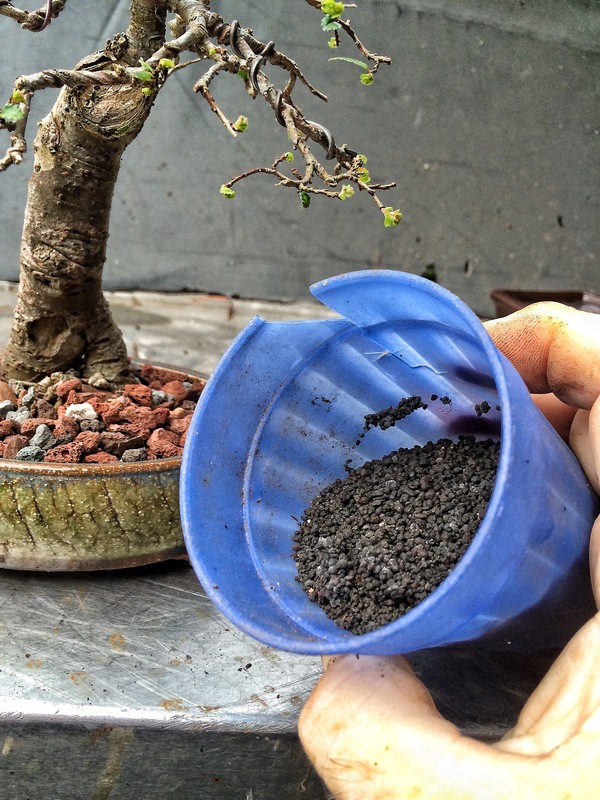 Look like you add/drop a few components from your original post of bonsai soil mix. 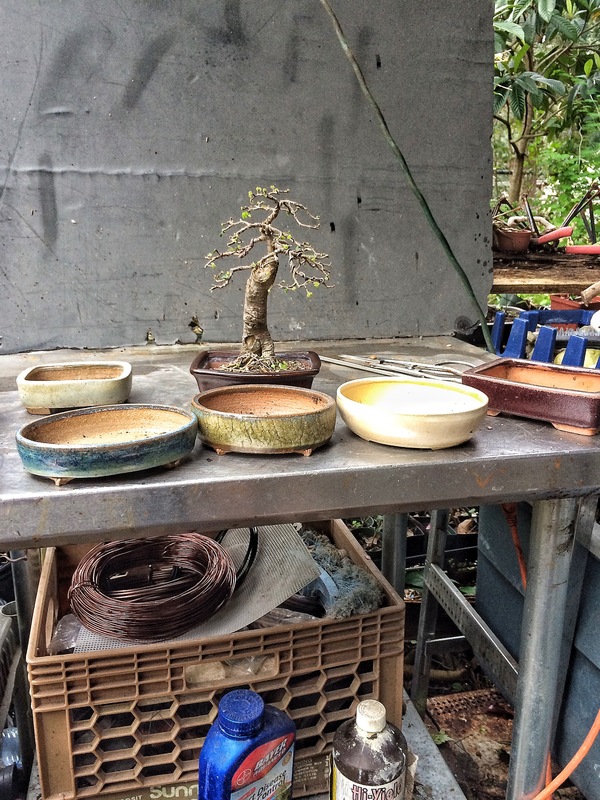 “So find a good pot dealer with good stock from all over the world, good prices and good varieties.” Pot and bonsai does go together…. 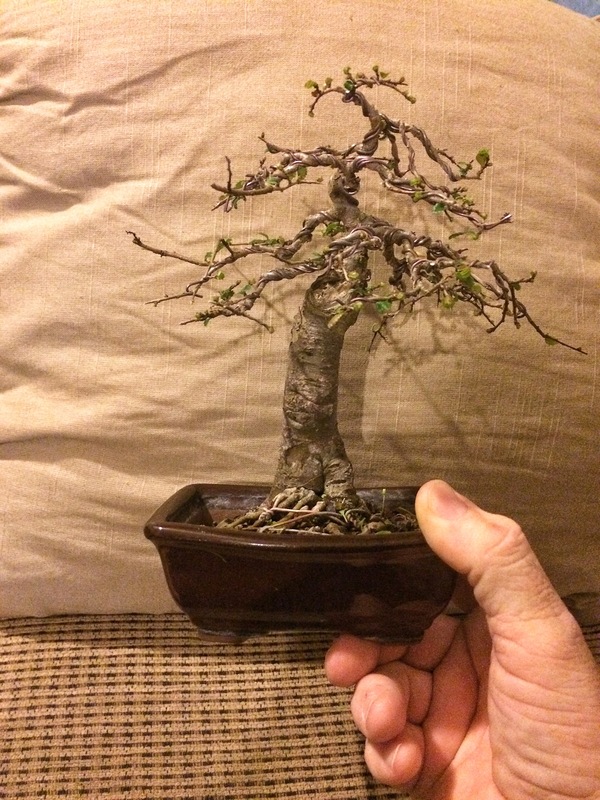 My daughter gave me a chinese elm for xmas a couple of years ago and it looks like your bit neglected tree .So my question is can I repot and roo prune it now (DECEMBER) in Australia which is summer here????? 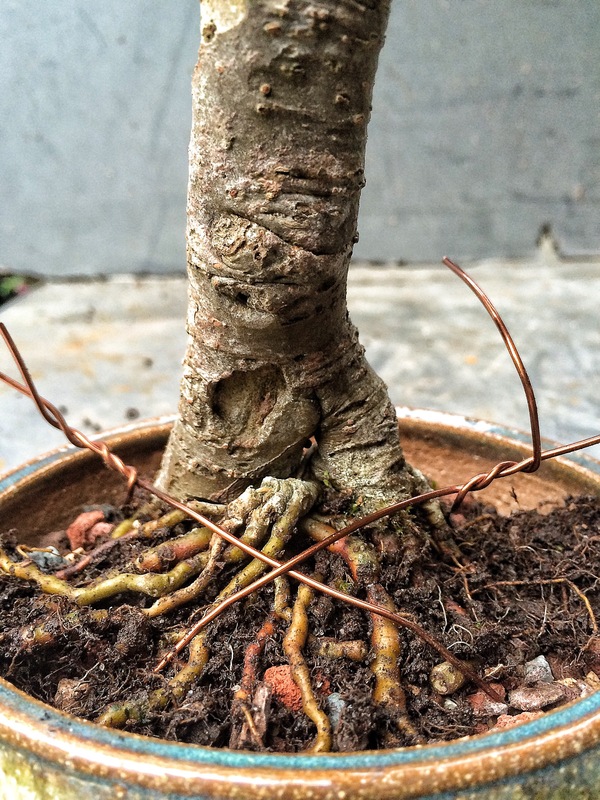 No, you have to wait for late winter to repot and root prune. Any deciduous tree is the same.